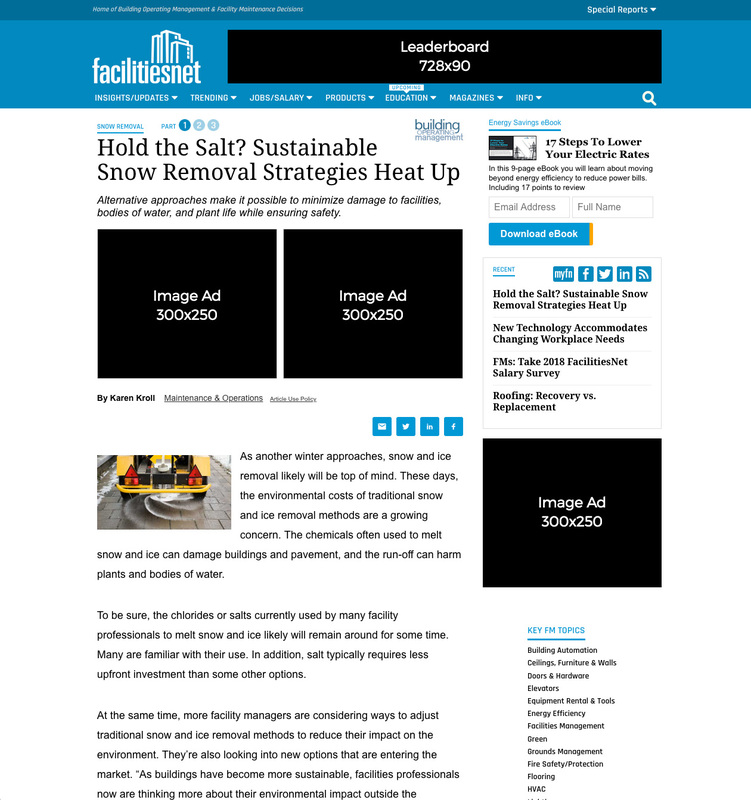 FacilitiesNet delivers timely, critical, in-depth information facility managers need to ensure institutional and commercial facilities are energy efficient, cost-effective, sustainable, and safe. 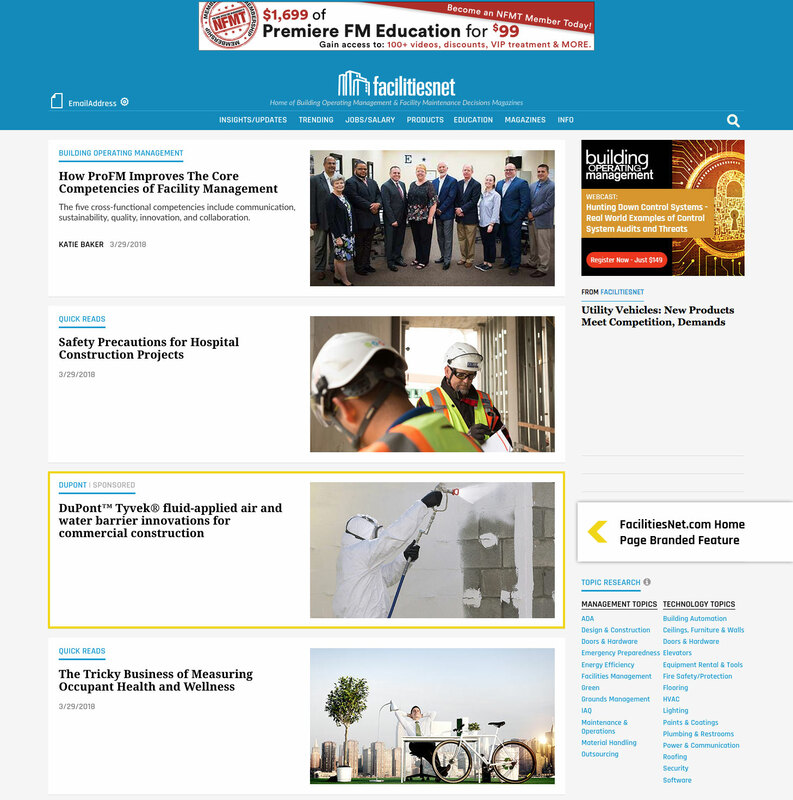 The digital platform ensures fast access to information on the full range of facility management and technology issues from the pages of Building Operating Management and Facility Maintenance Decisions magazines, while also delivering essential information on education opportunities, product advances, and career opportunities. 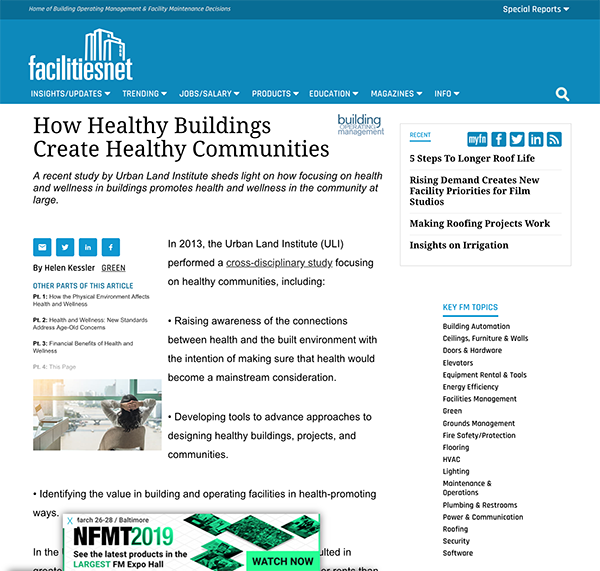 FaclitiesNet is the digital home for readers of Building Operating Management and Facility Maintenance Decisions magazines. Its foundation is the market-leading content of those two magazines and a whole lot more. By combining multiple information streams into one essential resource, it provides the solutions, insight and information that facility executives need to operate their buildings at peak efficiency. 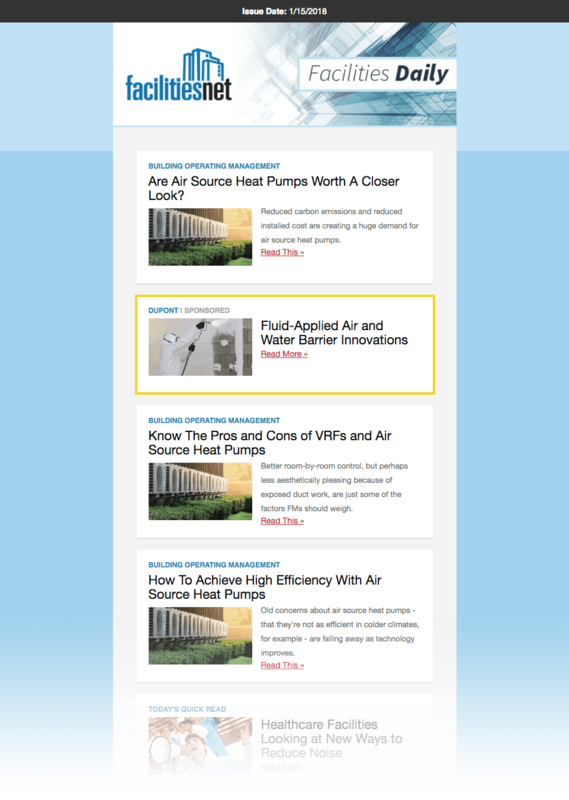 FacilitiesNet has become an essential resource for thousands of high-level industry professionals at every building type within the North American facilities market. These decision makers rely on FacilitiesNet. to help them ensure efficient building operations, optimum occupant safety, comfort and productivity. Digital media offers brands and organizations an affordable way to target and reach facilities professionals. It is especially effective as part of an integrated marketing strategy. The advantages of paid digital media are numerous. Your ad is seen by qualified prospects - facility executives who are researching products to purchase. You can put your brand in front of these prospects at every stage of the buying cycle In addition, you can target FMs by behavior, geographic location, demographics, interests, and more. With a digital campaign the metrics are built right in. You know exactly who clicked on your content, opened it, referred it, shared it, etc. You also can trace the source of your sales leads from entry to the actual purchase. Know exactly which ads brought in the highest number of qualifying leads. Know how many impressions were served, where they were served This will help you determine which strategies and advertising channels yield the best results and merit more investment. Because digital advertising is quick to measure-often with real-time results and metrics- you may find that it helps make your campaigns more cost effective. If a digital advertising program is not performing well, you can quickly and easily replace it with a new ad program. Online advertising campaigns are quickly measured — often with real time results and metrics. You have the flexibility to respond to incoming data and make changes instantly. It's easy to quickly adjust your ad campaigns to ensure that your budget is spent well and offers the best ROI. This flexibility allows you to stay in front of facilities executives, anticipate their needs and adjust your ads immediately. Digital and mobile marketing go hand-in-hand. Digital advertising allows you to reach facility executives on the go, wherever they are, whenever they are online. This is especially beneficial as more and more FMs are using their smartphone and ditching the desktop. Digital channels are highly cost-effective for marketers. Rates are typically set through a combination of ad size, ad location, performance, and demand. Considering the reach allotted via digital channels, an online campaign can stretch your budget further. Furthermore, digital campaigns have greater transparency, allowing you to adjust your cost easily based on performance. FacilitiesNet focuses on FMs who manage 500,000 or more sq. feet of buildings, are the primary decision maker or influence the buying decision, and have multi-million-dollar budgets. 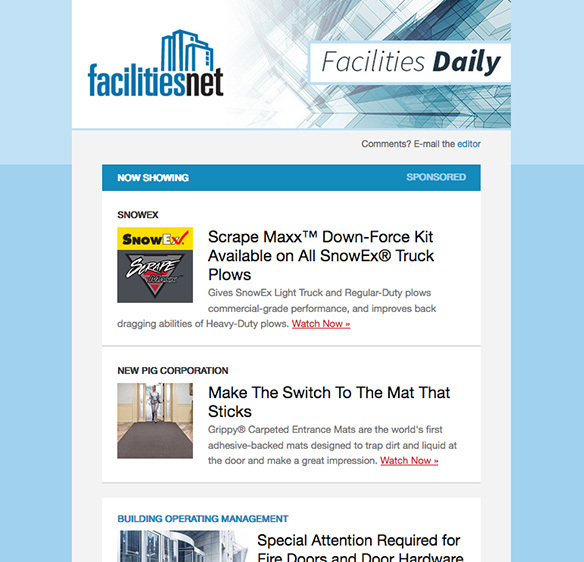 The must-read daily for the facilities professional, the Insider Daily E-Newsletter provides FMs with the information they need to stay ahead of the curve and includes the cost-saving techniques and strategies industry professionals utilize. 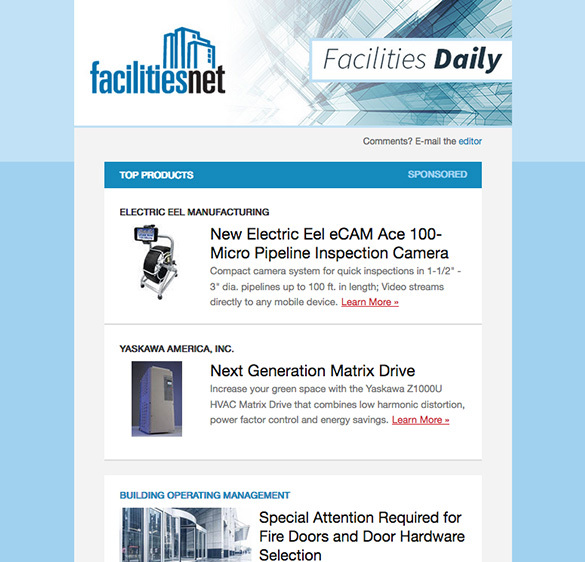 FMs rely on the Insider Daily E-Newsletter for the latest product and innovation information and insight on how manufacturers are meeting the needs of today's buildings. Frequently covered topics include: HVAC, energy management, greening your buildings, building automation, salary and career resources, lighting, design and retrofits, FM management, IAQ and more. You will receive a report with email opens and clicks. Include the URL to which you would like the ad linked. *Spaces and special characters are included in the character count. The Critical Facilities focused Insider Daily E-Newsletter delivers invaluable information directly to inboxes, providing intelligence on all things Mission Critical. Your report will include the names, titles, companies and street addresses where we have them for recipients who click on your content links. 125,000 high-level facility managers and engineering/maintenance managers who subscribe to Building Operating Management (BOM) or Facility Maintenance Decisions. Also includes premium circulation to facility professionals who have registered to attend NFMT, BOM and FMD webcasts or receive BOM and FMDs e-newsletters. Increase your visibility and drive traffic to your Web site. Inclusion in Top Products shows the facilities industry you're one of the best. Incredible ROI opportunity when you showcase your products and services to industry decision makers' inboxes. An easy and cost effective way to get your product message out in front of key buyers. Our high level reporting lets you know the quality of the readers you're reaching. 125,000 building executives, facility managers and engineering/maintenance managers who are subscribers to Building Operating Management or Facility Maintenance Decisions magazines or have registered for NFMT, Webcasts, E-Newsletters or other Building Operating Management or Facility Maintenance Decisions - related products and services. You provide a jpeg product photograph, product name, and link to the product specific page on your website. Get your video in front of the audience you developed it for. Videos drive results if they are seen by the right audience. Get new prospects to your website, educate customers and create awareness by having your existing company video featured in the Now Showing section of our eNewsletters. Sent to 125,000 industry decision makers. No ad materials - You provide a jpeg product photograph, product name, and link to the product specific page on your website. Promote your company to VPs, directors and managers of facilities management, energy and sustainability. 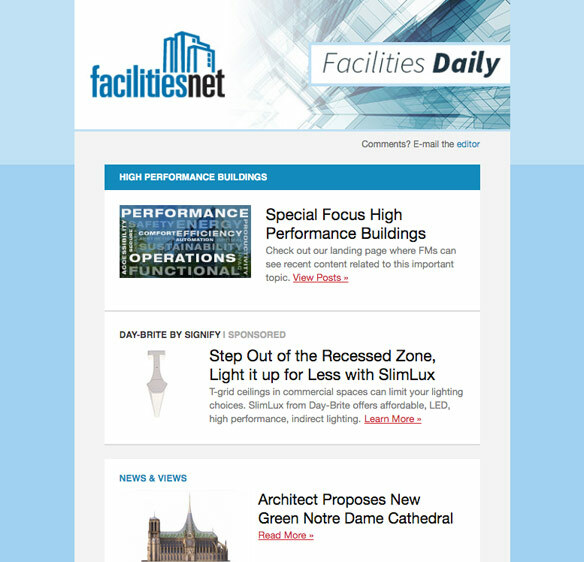 This e-newsletter focus is designed to help facility management managers integrate and optimize all of their major high performance building attributes, including energy efficiency, durability, life-cycle performance and occupant productivity. 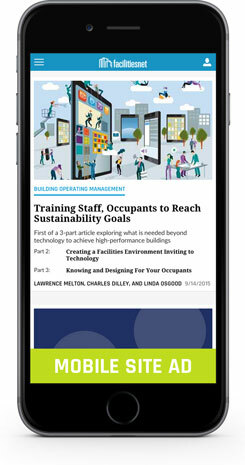 Managers will receive news updates, feature articles and various other resources related to high performance buildings. Get feedback from facility professionals in an easy and inexpensive way. Our templated, 3-question quick poll makes it easy for you to hear from your potential customers. You will receive a report with email opens and an excel file with the data from your poll. Take over all ad positions in the eNewsletter for a day to make a big impact. You get all three ad positions, plus a product release for premium visibility. Combining both display ads and native content ads to drive impact along with educational and engagement results for advertisers. Do it your way! Facility Industry Custom Emails allow you to tell your story to the FMs who need to hear it. Introduce new brands, generate new interest in established product lines or simply promote your message through a customized email. You supply the HTML, we do the rest. Custom Email is the opportunity you've been searching for to engage the FM universe on your terms. 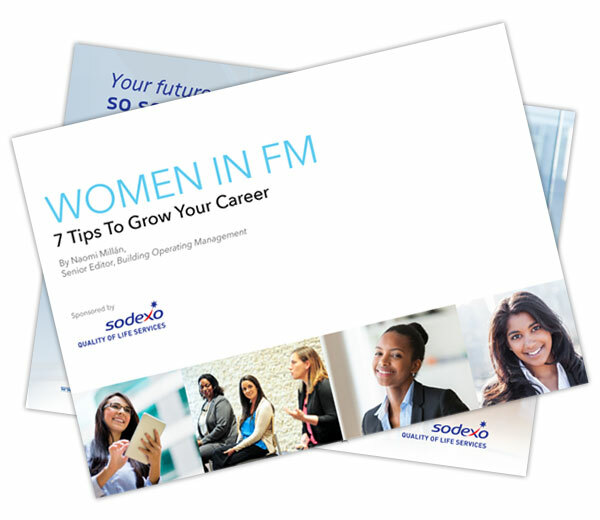 The FM Industry values White Papers as educational resources: deep dives on topics every FM needs to know. 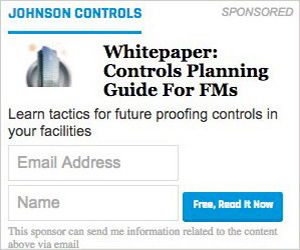 Position your organization as a knowledge partner by putting your White Paper in Facility Managers' inboxes, engaging them on a level that isn't attainable anywhere else. Video is now a preferred method of consuming info. It's an integral tool for every digital marketer. Tell your story in real-time and generate a new relationship on your terms. Leverage your existing investment in video by engaging the facilities audience. When FMs are researching products and services for upcoming projects, few content items are as valuble and powerful as case studies. Send up to three case studies to the Building Operating Management database and demonstrate the ROI you can help achieve through real projects, real numbers and real savings. Case studies are individually tracked, so you'll know who read which piece. Be the sole sponsor in one of Building Operating Management's award-winning feature articles sent via email. Associating your brand with our high quality editorial is the easiest marketing you will ever do. Select from two exciting mobile-friendly templates. We have identified facility professionals with the most square footage, the biggest budgets and decision making power. Between active requests from our user base and our circulation department's active list management to keep quality high we have done the work to help ensure you're reaching the right and most engaged audience. Choose a circulation size to meet your needs in 1,000 increments. Send an HTML version of your own completed newsletter designed to be 600 pixels wide or less (PDF files are not accepted.) E-newsletters containing 350 - 500 words perform best. Also provide a subject line with a maximum of 50 characters, including spaces and punctuation. Please refer to the Content Development Services section, below. Maximum number of 6 links per newsletter. Click tracking on links, provided by publication, are not tracked separately. There is one tracking entry per email. A proof will be sent to you prior to the e-newsletter mailing out. In addition to the base cost for this newsletter, there is a $500 net production up-charge for email personalization, including subject line and/or email body copy personalization. Send us a text headline and description of the video (maximum of 200 words) along with a maximum of 3 URL links (one main video and up to two additional). We will create a screen shot from the video. If you want to provide your own screen shot, it should be 550 pixels wide x 300 pixels tall. Send 3 case studies (as PDFs) along with headlines for each case study, or 3 headlines and 3 URL links to the case studies we can pick up. Targeting and reaching the right group is key when it comes to using your marketing dollars effectively. We can identify facility professionals who have read our content related to your product type and do an email blast only to them. If supplying your own HTML, have the email designed to be 600 pixels wide or less (PDF files are not accepted.) Email layouts containing 350 - 500 words perform best. (Hosted images and "in line style" is required) Emails should be set up for responsive design. A proof will be sent to you prior to the email blast for your sign off and approval. See our creative setup and design policies. 1. Provide a subject line with a maximum of 50 characters, including spaces and punctuation. 4. Clients opt-out/unsubscribe link must be embedded in the HTML along with a physical address. 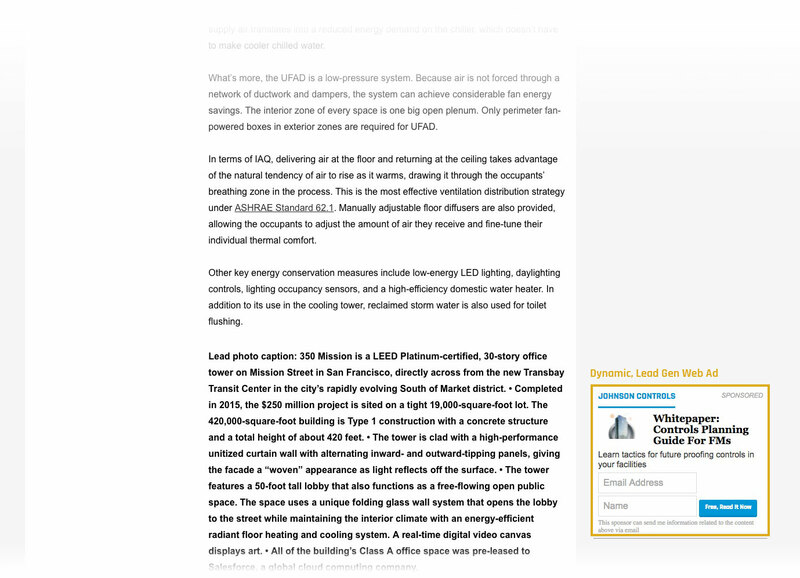 ● Link indicates user request to receive manufacturer's eBook, Webcast, White Paper or similar highly-valued content piece. I consent to be emailed regarding the content above. under buttons/links as needed to help make email consent more clear. Gated forms are the industry standard for collecting a users email address if you wish to email them directly and follow up with them. We can develop a gated form for your email blast and deliver you the email addresses in real time. Most potential customers will be in research mode when they see your advertising and need education and information. Because of that, gated forms perform best when there is a strong sense of value for the user to fill out the form. Most frequency that is done through a content asset like an educational white paper, an eBook or video. These generate Marketing Qualified Leads that you can then follow up with and nuture to a sale. We can also develop forms if you have a special coupon or sale for form users. Or you could use it as a way for users to request a demo, request a quote or get a free sample from you. We can add additional fields to our forms at the customer's request. But keep in mind that fewer fields will result in better engagement. Our Run-of-Site (ROS) advertising is intrinsically targeted to the buyers you want to reach. Take it to the next level and place your ad contextually and hyper-target your campaign — your ad appears on content directly related to your product or service. FMs researching specific technologies are highly engaged and likely to be primed to purchase your product in the near future. Advertise in one of FacilitiesNet.com's contextually targeted areas and watch your ROI skyrocket. For run of site advertising, please provide a leaderboard ad, an image ad, and a mobile ad. Our Contextual Advertising on FacilitiesNet allows advertisers to target their ads not only to facilities professionals but also directly to the pages on the site that relate to a specific topic the user is currently engaged with. This double targeting allows advertisers to reach a specific audience and at the same time make an impression on the user at the exact moment they are engaging with content which relates to the advertiser's message. Getting in front of users at the moment of engagement within a relevant and trusted context is incredibly valuable. Advertising options include leaderboard and image ads. To select a specific ad position talk to your sales representative. For contextually targeted advertising, please provide the following 3 ad sizes. Get better conversion rates with your content marketing assets. We create an ad for you with form fields right inside the ad. We've seen increased conversion rates when comparing to the traditional landing page approach. Some programs have had a 100% higher conversion rate when comparing to their landing page with form. Ad text and pdf are vetted for approval. Take over ads make a big impression on our site, and isn't advertising all about making impressions? Your ad repeatedly welcomes visitors to the site, leaving a lasting impact. Splash and Floorboard ad opportunities are high-visibility ways for you to promote your brand. The ad appears for 7 seconds; animations must be shorter than 7 seconds for the entire sequence to be displayed. The ad appears once per user session. TASKI IntelliPad®. The Intelligent Floorcare Pad. Is there anything video can't do? Video ads drive results. Bring more prospects to your website, create awareness and increase sales by having your existing video featured on FacilitiesNet. URL of video on YouTube. Video on YouTube must be sharable. Now you can with the FacilitiesNet Mobile Site Ads! Take advantage now and gain exposure to on-the-go FMs monthly. As an advertiser on FacilitiesNet Mobile, your ad will be displayed on every visit to FacilitiesNet from a mobile device - use your ad to build brand awareness and increase web traffic with no competitive ads in sight! As the web moves towards mobile-friendly websites, position yourself on the cutting edge of technology with FacilitiesNet Mobile. Whether visitors come from search or email, direct or referral, your ad will be front and center for the duration of these high-value visits. You will receive reports detailing interaction with your ad in terms of monthly impressions and clicks. 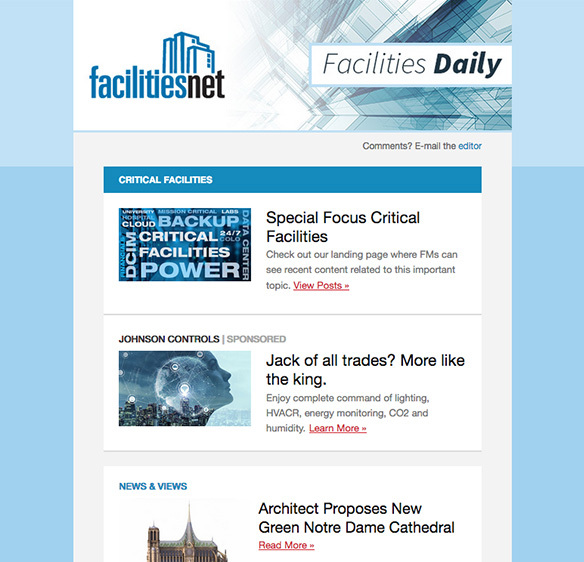 FacilitiesNet is the best place to get in front of key facilities professionals, and we can help extend your message by targeting FMs all across the web. Reach the people you want to do business with. Target top prospects that you know you need to reach, but otherwise can't get in front of. Drive more FMs directly into your purchasing funnel. Our standard retargeting campaign puts you in front of facilities decision makers, helping you build mind share, create awareness and generate leads. Our double-targeted behavioral campaign targets facility professionals, and takes it one step further by identifying prospects who are actively researching and reading topics relevant to your products and services. You reach facilities decision makers when they are in a buying mind-set - at the exact moment that they are engaged with content that relates to your product. You provide your campaign budget and campaign duration. Our experienced digital media managers and analysts will custom configure your campaign and make recommendations with your targeting needs in mind. Animated gifs must end after a max of 30 seconds. HTML5 not allowed. HD animated gifs are not supported. When you need major impact a roadblock ad is a perfect solution. You dominate all above-the-fold display ad positions and, to increase the impact of your campaign, two responsive images on either side of the content are included to drive home your brand and messaging. Looking for an interactive ad experience where you can also gather data from potential customers in the facilities management industry? If so, try one of our easy-to-use poll ads. Our poll ads are a great way for you to gather data without needing additional IT support to generate a form. Having the form inside your ad on the site provides the best engagement for your poll. Make an unforgettable impression with a sticky ad. 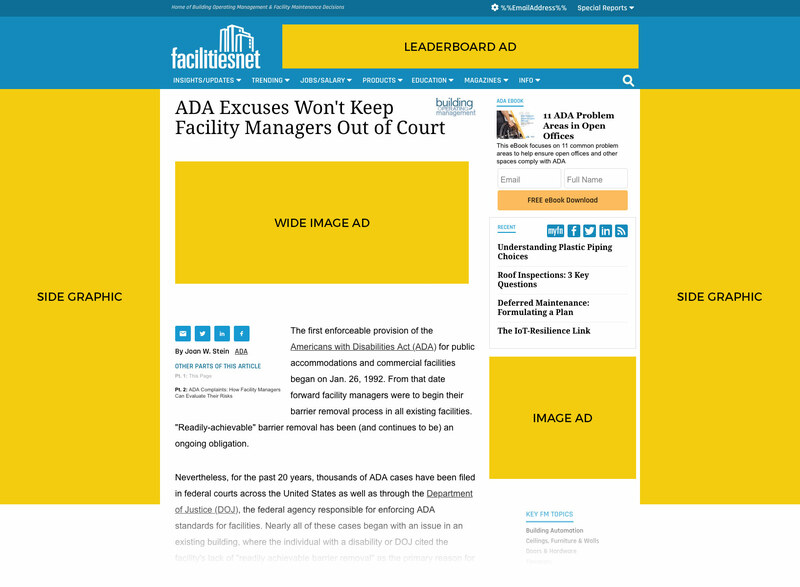 FacilitiesNet's Catfish ad opportunity is a high-visibility way to promote your brand. This ad really stands out by sitting in the content area and staying in place as rail professionals scroll down to read. You can't help but see and read the ad. Talk about leaving a lasting impression! Limited inventory available, ad appears only once per user session. We will add the close button to the left/top of the ad over the creative. It is 25x25 pixels. We do the creative and run a custom marketing campaign for your event that includes eNewsletter, website and email promotion to our high-value audience. Sole-sponsored, custom content-you choose your topic. We'll assist in copy review, slide generation and provide experience and expertise to assure a successful event. It's your opportunity to get in front of and present your expertise on your solutions to challenges FMs face on the job. Presentation is a 30 minute, fast-paced broadcast, prompting facility managers to continue dialogue after the event. 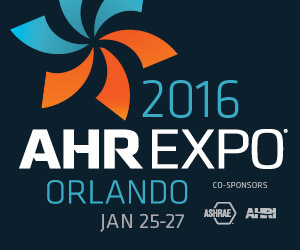 * Live events are limited to 1,000 attendees at the same time. Your logo appears on the landing page and marketing materials leading up to the event. Get market data by asking one single-answer multiple-choice question on the registration page (with up to 5 possible responses). You receive database of registrants and attendees (Email address, Name, Title, Company, City/State, Phone ). You get 12 months of bonus exposure as the webcast is archived on FacilitiesNet.com. Our 2019 webcasts address vital trends in facilities management. One of the most challenging aspects of managing a facility is replacing a roof, and one of the most frequent mistakes made in that process is specifying the same roof as the existing one, assuming the original choice was the correct one. Managers must do their homework before making a final decision, and consider all options. This webcast provides a roadmap to selecting a new roof system that optimizes performance and ROI. A range of threats must be considered when addressing facility security, including unauthorized access, workplace violence, theft, and in some cases bombs and biological agents. Advances in security technology help address myriad concerns, but without a clear understanding of a building's specific vulnerabilities and necessary security protocols, a facility and its occupants will remain at risk. This webcast offers an overview of best practices that are applicable to buildings in most types of organizations, from integrating security technologies to standardizing systems across an entire portfolio. August: Fire Safety Codes: Is Meeting the Minimum Enough? The myriad codes and standards that apply to a facility's fire protection systems—including automatic sprinkler and suppression systems, emergency and exit lighting systems, emergency power supplies, and alarm systems-can provide guidance, but are they enough to ensure the appropriate level of fire safety for your facility? This webcast addresses how to evaluate fire system specification, operation and maintenance requirements as they relate to existing and emerging codes as well as your specific facility's needs. Over the last 15 years, most building operators have come to recognize people account for the majority of interruptions to critical operations. In fact, human error is identified as the root cause in 60 percent to 80 percent of data center downtime events, year after year. Infrastructure systems and component failures still merit attention, but today's rigorous design, construction, and commissioning practices generally provide an expectancy of smooth equipment operation for 10 years or more. Attendees of this webcast will learn how to focus the proper attention and resources to training on best practices to ensure human error potential is absolutely minimized. Please contact Brian Terry, Facilities Digital Publisher to discuss additional topics and the opportunity to customize a webcast for the facilities management industry. An easy way for you to align yourself with high-quality content and identify targeted leads with email address. Our pre-written eBooks educate on the issues and solutions FMs are currently researching. By sponsoring an eBook you can identify the FMs currently researching products like your's and begin nurturing them with your lead development process. eBooks also align your company as a thought leader and solution provider without all time and expense of generating your own customized, high quality piece that speaks to this audience. We've had great success with lead generation on eBooks. Our audience wants and needs this relevant information. We promote eBooks throughout our website and our eNewsletters for a month's time; this ensures your brand is seen by thousands of potential customers in the facilities management industry. eBooks only have one sponsor and these leads are invaluable — make sure you don't miss out. 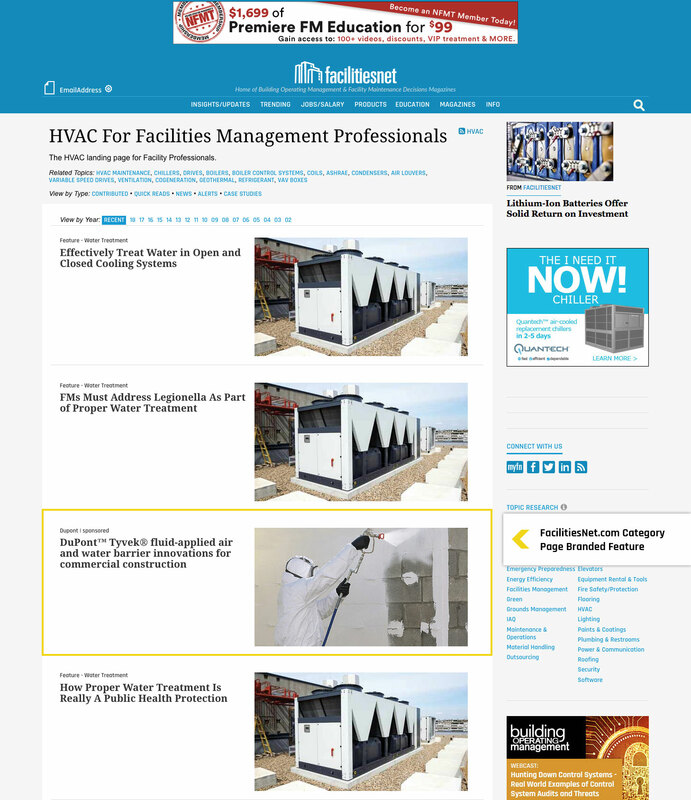 Branded features appear in the news feed along trusted and topical content from FacilitiesNet. You have a message and you need it in front of this audience of decision makers. *Content is subject to review and may be edited for length, clarity and style. Branded content is intended to provide useful or otherwise engaging, non-promotional information to facility professionals. The Virtual Edition of Building Operating Management or Facility Maintenance Decisions is a fully interactive copy of the print magazine. Virtual Edition sponsorship consists of a full-page ad placed across from the front cover, an exclusive top-of-page banner visible on every page, as well as sponsor recognition weekly in our newsletter for a month. The sponsor ad and banner in the virtual edition are clickable to your provided url. White papers are a key compontent in content marketing strategies to build thought leadership, awareness, consideration, preference and favorability with a brand. They are an effective tool to support upper funnel marketing objectives. They are especially important in the facilities management industry.